Garage door maintenance is a preventive service. It includes a thorough inspection of all garage door parts for the detection of problems or damaged components. It also includes a series of repairs that will ensure every part continues to work properly and future problems will be prevented. During the service, parts are lubricated, adjusted, repaired and tightened. The meaning of maintenance service is to solve imminent problems, make small improvements and ensure the garage system will operate properly and be safe. Since all parts are thoroughly checked and perfectly treated during the service, they will hardly give homeowners any trouble for a long period of time and will last more years. Part Replacement - Weather seals, brackets, bolts, rollers, cables - every worn or malfunctioning part will be replaced with a new one to make sure your door safe to use. Troubleshooting - If your door is moving too slowly, too quickly or is out of balance - we will look into it and get it back to safely and perfectly working order. Safety Inspection - Making sure your car is safe to drive is important, yet making sure your heavy garage door is keeping you safe will opening and closing is just as important. We will make sure the eye sensors and reverse mechanisms work as they should. 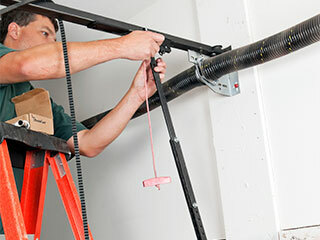 We do our best to prolong the lifespan of your garage door and every one of its parts. With our knowledgeable and meticulous technicians, we manage to offer perfect services. Garage Door Repair Fayetteville has been this field for over a decade, and we know how good maintenance makes a difference to the way the door moves and the longevity of the system. Our technicians are all fully qualified, experienced, and equipped to tackle any challenge.